Winegrape growing is nothing new to LangeTwins Family Winery and Vineyards. As part of a generational farm family dating back to the 1870’s, twin brothers Randall and Brad Lange grew up with the family passion for farming. With determination, they have made their ranch a benchmark winery and vineyard centered in Acampo, just north of the city of Lodi. Arriving at the state-of-the-art winery you get a sense of their breadth with the visible vast stainless steel wine tanks. 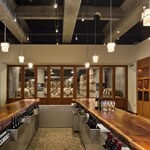 This modern feeling continues as you reach the tasting room, The Press Room. A water feature entry located beneath the elevated crush pad takes you into the heart of the winery, but also into a welcoming space that brings the family’s passion for wine and sustainable winegrowing to life. Nestling up to double 22 foot redwood bars to taste their impressive portfolio of estate, reserve, single barrel, and winery exclusive wines, is just the start of what they offer. If you desire something more, they will open the glass cellar doors, by appointment, to host a wine and cheese pairing experience in their high backed leather couches. Furthermore, you may reserve a private tour of the winery which involves exploring the winery on foot or in a chauffeured electric vehicle (maximum of five people). You will make your way from the elevated crush pad, to the barrel room and other locations within the winery. They also offer a wine club which includes a 20 percent discount as well as invitations to release parties and other celebrations. Aside from quality wine, LangeTwins Family Winery and Vineyards is focused on sustainability and habitat restoration. They have been recognized for their efforts by several organizations and are the recipients of the 2006 Leopold Award and the 2014 International BRIT Award. Part of their sustainable program is noticeable while you visit – from the habitat restoration to the solar arrays.